How about a weekend interview? Richard Buzzell talks about his latest book, ZombieStop Parade . Enjoy. Tell us a bit about ZombieStop Parade . Where did you get the idea and what do you hope readers take away from it? 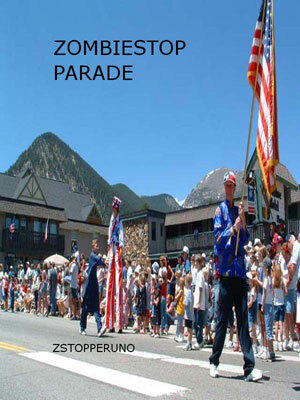 ZombieStop Parade is a story about intellectual street fighting conducted through online media. The book started with the central character and evolved from there. It required a multitude of ideas to get it to the point of completion and most of those ideas were never used. Some of them were good ideas but just not appropriate for the content or feel of the story. I made an effort to be focused with the story so it wouldn’t go running all over the place. If I had wanted to write a 500 page story, I guess I would’ve needed to have used every idea I had. I think that in writing a story, what you leave out is as important as what you leave in. Some times writers can get so caught up in the challenge of trying to fill the empty page, that they can be tempted to try to pawn off filler as valid material. I think that shorter books will help to address this problem. What I hope that readers will take away from the story is a sense of possibility. Beneath all the complications, ultimately it’s an inspirational story. Most of my writing in the next year will be non-fiction addendums to the ZombieStop story. It’ll be stuff I post online. The most interesting book I read lately was, A People’s History of Science: Miners, Midwives, and Low Mechanicks (Nation Books) by Clifford D. Conner. Plows Plagues and Petroleum by William Ruddiman. I like to read and shoot my mouth off. Nowhere. I am suspicious of the institution of celebrity and do not want to cultivate it for myself. Someday I`ll be posting some writing to my website, ZombiStop.com, but I need to escape from book-promotion-hell first. If I ever do achieve any success with this book, I hope that it will inspire some new writers to go off in brave new directions. This book breaks pretty much all the rules. If I can get away with that, then it will be possible for others to do so as well. Be the first to comment on "Interview: Richard Buzzell"